View of Market Slip. Taken from the Corner of Cherry St - 1959. 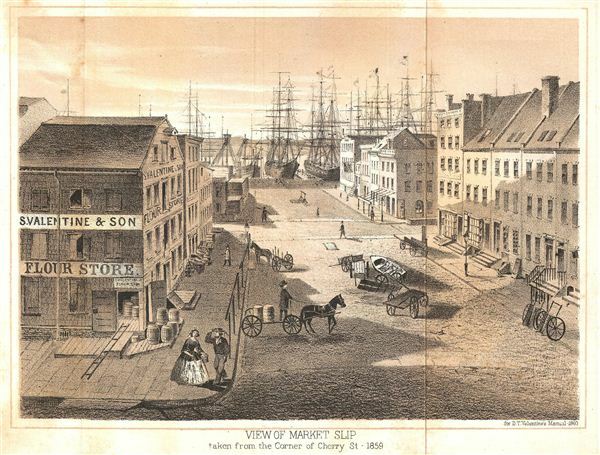 An exquisitely detailed view of Market Slip in 1859, from the corner of Cherry St. Features S. Valentine & Son Flour Stores, a man touching the brim of his cap in deference to a lady, horses and buggies. Today Market Slip is located on the east River between the Manhattan and Brooklyn Bridges. Published as part of D.T. Valentine's Manual of the Corporation of the City of New York 1860.